Our durable, stainless steel pizza cutter is perfect for cutting pizzas , pie crusts, pastry dough, flatbreads and much more! Strong, rotary style wheel is designed for effortless use and convenience. 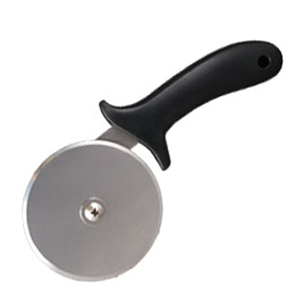 Keep up with all of your pizza orders with Wildwoods pizza cutter! Or use it for baking to cut cookie or other dessert pizzas. With a cutting wheel made of stainless steel, this product is durable and easy to clean. The molded and black plastic handle offers a comfortable grip which makes the cutter easy to maneuver and control. Extremely reliable, this product is perfect for any and all of your heavy-duty task needs. This modern style is a great accessory for any home! At 8 inches long, there’s no more struggling to cut all the way through! EXTRA SAFETY – Thick, easy-to-use handle fits perfectly in your hand – Extra finger grips to reduce slippage and keep your hands safe as well as a thumb guard near the blade for added safety! An attractive shape and extra balance and stability makes cutting waffles, baked pastries, and tortillas easy! CLEAN UP IS A BREEZE – Strong design won’t weaken at the joint or rust – Dishwasher safe utensil that will last for years to come! Or simply wash with soapy water, rinse,and wipe dry! It’s that easy! PERFECT CUTS EVERY TIME – Impress your friends and family with beautiful meals cut precisely with help from Wildwood! No more going over the same slice again and again, one time is all it takes! Makes slicing anything faster and more efficient, even deep dish!